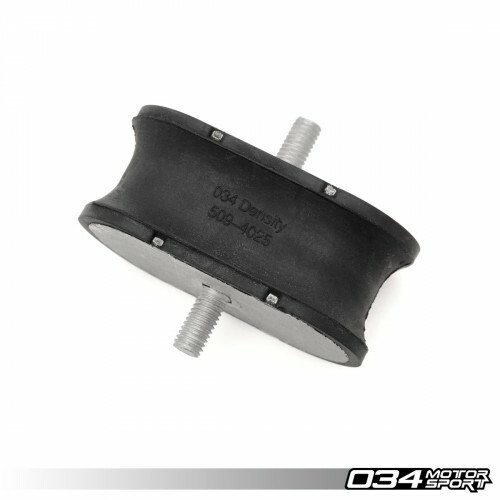 034Motorsport is proud to offer our Street Density Transmission Mount Upgrade for the B8/B8.5 Audi A4/S4/RS4 and A5/S5/RS5! The factory Audi transmission mount assembly features a soft rubber damping medium, which allows for excessive transmission movement at increased power levels, and can break down over time. This movement can be observed as hesitation or lurching when accelerating, decelerating, and shifting. This high durometer performance mount upgrade is designed to be a direct, drop-in replacement for the factory damping medium, and limit unwanted transmission movement. By reducing slop, this upgrade ensures that you're experiencing crisper shifts and a more connected driving experience. This upgrade will introduce some additional, perceivable increase in noise and vibration transfer into the cabin, especially on vehicles equipped with the Tiptronic transmission. In addition, the factory transmission mount assembly components are not available separately from dealerships, and premature failure of this mount can result in having to buy the entire assembly. The Street Density Transmission Mount Upgrade from 034Motorsport lets you reuse the factory cast portion when replacing/upgrading the stock mount. This mount was thoroughly tested by 034Motorsport, and independent Audi enthusiasts before release. Installation is very straightforward, and is completely reversible.